Do you remember when you learned to tie your shoes? Maybe that's too far back and the details are fuzzy. How about when you learned to type? I remember that well. It was during my freshman year of high school, the first period of the day, bright and early. My fingers were still asleep! As I clicked away at the IBM Selectric typewriter, it seemed so awkward. But as I practiced each day, I became more and more comfortable and my skill improved. By the end of the semester I was typing over 50 words per minute. Tying your shoes and typing are both examples of physical (mechanical) skills that improve with practice. The clicker training process involves several physical skills, too—keeping your hands and body still as you observe the animal, marking the behavior with a "click," and delivering a reinforcer to the animal. These skills, plus a few other elements, are known collectively as "clicker mechanical skills," or simply "clicker mechanics." Other elements of clicker mechanics include: knowing the behavior you want to click, observing the animal until you see the behavior you wish to mark, and knowing when to click (timing). It sounds like a lot to learn, but these skills really overlap. For example, once you've developed your observation skills, you'll know when to click—it comes naturally. And by training your body to remain still during a training session, you become skilled very quickly at delivering your reinforcement as a separate action distinct from the click—click and then treat. The click and the treat actions are sequential, and don't overlap. The wonderful thing about clicker mechanics is that they continue to improve with practice. This is true whether you are a new clicker trainer, or have years of experience. When I first began clicker training, it was a lot like learning to type: I was a little clumsy, and my timing wasn't quite right. I tended to reach for the treat at the same time I was clicking. It was awkward; I felt embarrassed if someone was watching me. But just as I practiced and improved my typing skills, I practiced and improved my clicker mechanical skills. And as I became comfortable, my confidence improved, too. The wonderful thing about clicker mechanics is that they continue to improve with practice. Why are clicker mechanics so important? The "click" marks the behavior, giving your animal information—"Yes, that is the behavior." The reinforcement (a piece of food, play with a toy) comes after the click. The animal quickly learns that the behavior he was doing when he heard the click will be reinforced. And, because of your well-timed click, he knows precisely which behavior to repeat to earn additional clicks and treats. Practicing mechanical skills, you become skilled at delivering a clear and precise message. In this way, the animal understands the information in the click, rather than having the message diluted or blocked by extraneous movements or clumsy treat delivery. Are you ready to practice your mechanical skills? In these practice sessions you'll complete exercises that don't involve an animal, allowing you to get comfortable with the mechanics of clicker training first, and then approach a training session with your animal with confidence. In fact, I recommend that you do these exercises without your animals even present. Why? If your animal already knows about the clicker, he will be looking for a reward after the click. 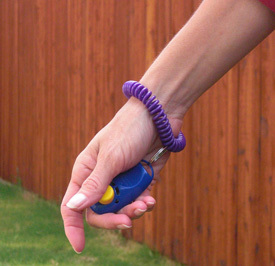 If your animal does not know about the clicker, you want to introduce it at a time when you can pair the click with a reinforcer. So it's best to leave the animal out of the equation for the moment. You can do these exercises with a box clicker or with an i-Click. My personal favorite is an i-Click on a wrist coil. With the i-Click, I like the fact that I can click no matter where the clicker lands against my palm. At least one finger can always reach it. It's even possible to click the i-Click with an arm or foot! If you prefer a box clicker, that's fine. It's important to be comfortable with the tool. Begin by simply clicking the clicker. Switch hands and click some more. Change the position of the clicker in your hand and click some more. How does it feel? Is there one hand where the clicker feels more comfortable? For most people, the dominant hand feels more comfortable at first, but with practice both hands can begin to feel comfortable. Ready to add another step? Keeping your body still during training is an element of clicker mechanics. The delivery of the reinforcement (a food treat, for example) is a distinct, separate action from the click. Why is this so important? Imagine you are training your dog. If you click the clicker at the same time you are moving your hand to deliver a piece of food, which do you think your dog will notice, the sound of the click or the movement (and smell) of the food? In most cases, the movement of the "treat hand," the one reaching for or delivering the food, will be the dog's focal point. The sound of the click—and information you intended to convey with the click—will be diluted or blocked altogether. To practice keeping your body still, repeat Step 1 above. This time hold your hands still at your sides or in your lap as you click. Even the hand (or other body part) clicking the clicker should be as still as possible. Sometimes the instinct is to point the clicker at the animal or move it to emphasize "I'm clicking," but this movement is not necessary and can distract the animal. Strive to keep your body as still as possible, so that the message of the click is clear. Practice this step for a few repetitions, and then move on to Step 3. The delivery of the reinforcement (a food treat, for example) is a distinct, separate action from the click. For this step you can recruit a friend, or you can use our old friend, the television. If you work with a human partner, decide in advance on a behavior to click. For example, you can click when your friend lifts two fingers, like a peace sign. If she raises one finger or three fingers, you don't click, but the instant she raises two fingers, you click. As another example, have your partner bounce a ball. Click the instant the ball touches the ground. Or, click when the ball reaches the apex of the bounce. Be creative—what other "clickable behaviors" can your friend do? If you're working with the television, try clicking each time an actor turns his head, or click when the camera angle changes. If the show has a lot of close-ups, click when an actor blinks. After a few practices, stop to evaluate. How do you feel? Did you remember to keep your hands and body still? It might have felt challenging at first, but it likely became easier as you practiced. Guess what? When you reach this step, you will have also begun to develop some keen observational skills. Your skills of observation will help you know exactly when to click when you work with an animal on a specific behavior. The possibilities for practicing clicker timing are endless—have fun with it. When you're feeling comfortable with the mechanics of marking behavior, move on to the next part, which is the delivery of the reinforcer. By the time you begin this step, you will probably feel pretty comfortable with several skills and elements of clicker mechanics: observing the animal, clicking when you see the behavior, and keeping your body still throughout the process. With these skills in place, it's time to practice delivering the reinforcement. When I'm first training a new behavior with my dog, I usually reinforce with a food treat she really enjoys. I choose something that's small, and easy to chew and swallow. I want her to be able to eat the treat quickly and be ready to try again. In this step you are still practicing without the animal, though, so work with dry beans or something similar. (You'll also need a cup or something similar to place the beans in as you "deliver" them.) Count out 10 "treats" (beans). Hold them in your hand or in a bait bag. For the first part of this exercise, you'll just be delivering the reinforcer, without clicking first. We'll add the click back later. Consider the delivery of all 10 treats as one session. Begin your session with your hands at your sides or in your lap, and then move one treat to the cup. Move your hands back to your sides, and then deliver another treat to the cup. Complete the session, delivering all 10 treats, one at a time, to the cup. Repeat for several sessions. Try alternating hands; delivering treats with your non-dominant hands takes more practice. When you're feeling comfortable keeping your hands still and delivering one treat at a time, get your clicker ready. It's time to put the steps together. For this step you'll need your clicker, beans or treats, and the cup. 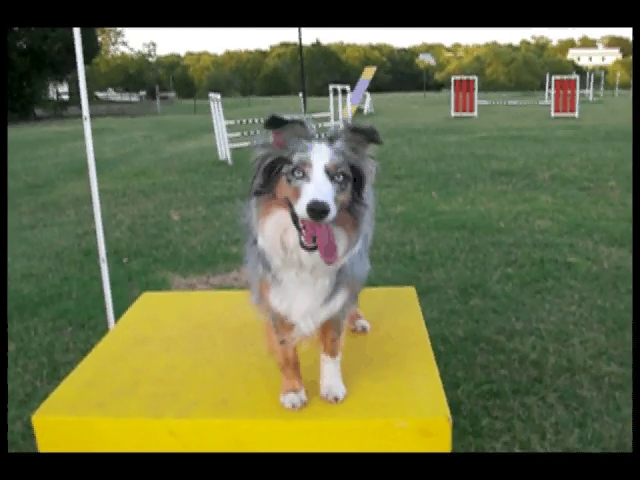 You'll also use this video that shows my dog Jessie performing "sit" and "down" behaviors. The video has no sound, so you won't hear me giving Jessie any cues. Here's the plan: Keep your body still, hands at your sides or in your lap, with your clicker and treats at the ready. Watch for the chosen behavior, click when you observe the behavior, then deliver a treat to the cup. When you watch the video, the behavior to click is "sit." With your clicker and treats ready, watch for Jessie to sit. The instant she sits, click, and then, as a separate action, deliver one treat to the cup. Repeat the process each time Jessie sits. Don't worry if you don't catch all the sits at first; you can replay the video and practice as many times are you like. If you empty your cup after each session, you'll be able to count out the number of clicks/treats per video view and track your progress. Are you catching more sits each time you watch the video? (How many sits did you click? There were 18 altogether.) When you've clicked all the "sits," watch the video again, this time clicking when Jessie lies down, or when she stands up. When you have completed the exercises, and practiced clicker mechanical skills to your own level of comfort, it's time to put that assurance and ability to work with your dog. Mastering clicker mechanics gives you the confidence to begin training sessions with your own animal. Before each training session, and before you get your animal involved, take time to prepare. Gather your clicker and treats, decide on the behavior to click, and mentally review the skills and other elements of clicker mechanics. Invite your animal to join in as you start training a new behavior that is important or exciting to you. Be sure to have fun together! Submitted by menews1 on Mon, 2011/01/31 - 4:47pm. Shouldn't there be sounds with the video. Really would have like to hear that. Submitted by taylor6123 on Tue, 2010/11/16 - 8:22pm. This is probbably a dumb question, but do you say the command then when the dog obeys do you do the clicker then give the treat? Submitted by WiccaMel on Tue, 2010/08/31 - 12:19pm. Will the clicker method work for older dogs? Submitted by WiccaMel on Tue, 2010/08/31 - 12:18pm. I have a 1 year old yorkie-pom. Will the clicker method work (teach an old dog new tricks)? Submitted by rexmom on Tue, 2010/07/13 - 9:12am. I had a dog trainer come to my house last night and she used clicker training. I was not sure it would work with him but it did! In 1 1/2 hrs she observed his behaviors...and mine...and then started showing both of us the clicker method. He learned sit, down, come. He even remembered it this morning. I am so excited that we can correct his negative behavior with rewarding positive means. If it will make him happier and less anxious and he behaves better...we both win! Submitted by Serferss on Wed, 2010/07/07 - 10:31am. I am just finishing "Don't Shoot the Dog" which was recommended in Paul Owens' excellent book. "The Dog Whisperer". Karen makes an incredible argument for positive reinforcement, and I look forward to using clicker with our two wonderful labs. Thank you for this wonderful article to get me started!